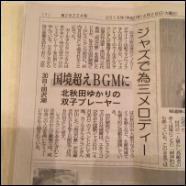 The concert report by Ryota Kojima, Japan's jazz critique is now on Kobejazz.jp, Japan's major jazz information website. Jazz & Shamisen Concert by The Maguire Twins & Sato Brothers played to the packed audience and they demonstrated their new possibilities. 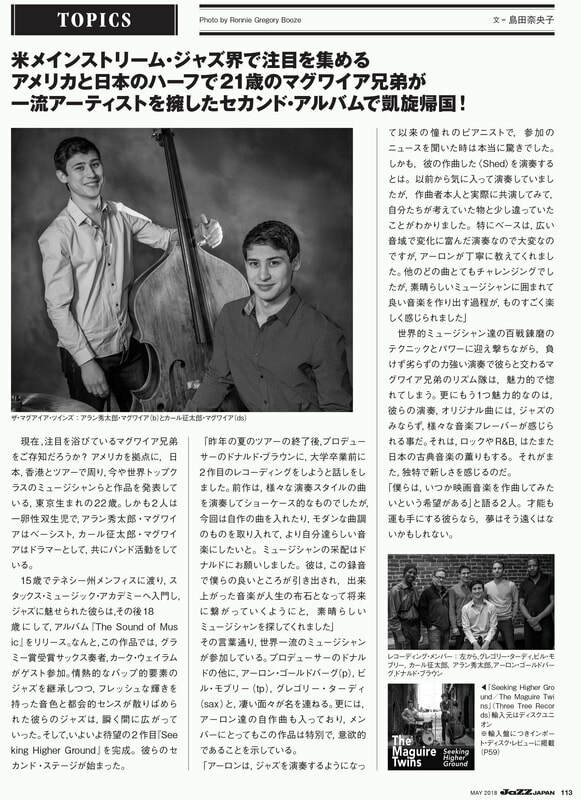 The Maguire Twins interview is now on kobejazz.jp Jazz People. Please click to read the detailed story of the musical twins! 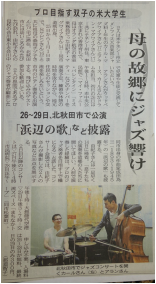 JA Sousai Center will organize 'Jazz & Shamisen' concert with The Maguire Twins and Sato Brothers. The Maguire Twins and Sato Brothers are to play at Jazz & Shamisen Concert on November 16th. These 2 sets of brothers are to bridge borders and different genre of music. 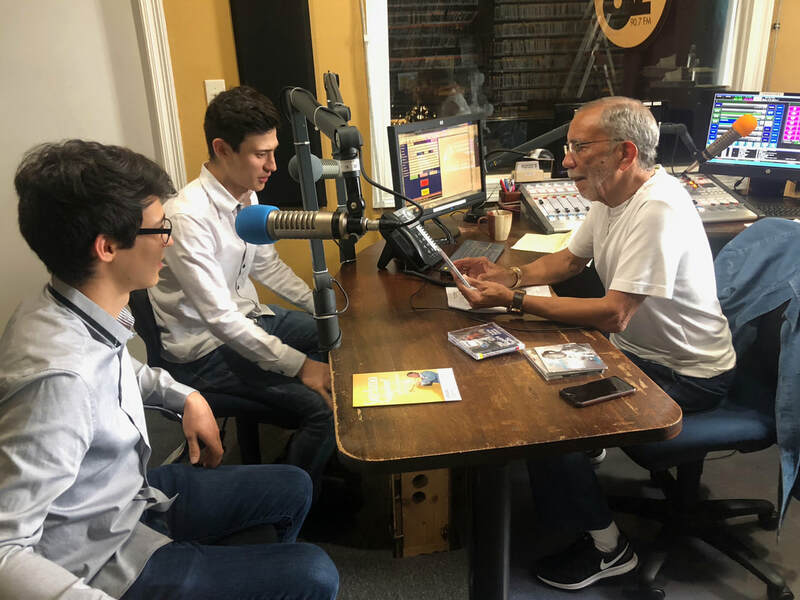 The Maguire Twins had an interview on WWOZ FM90.7 in New Orleans, LA. 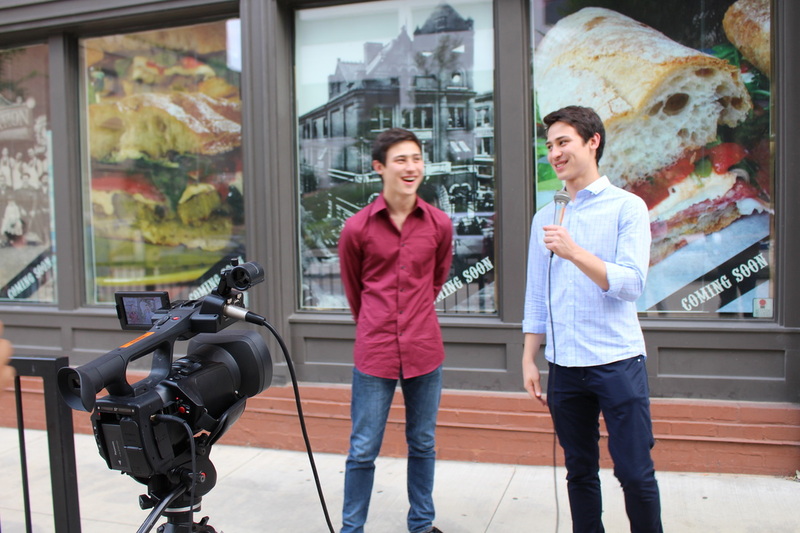 The Maguire Twins had an exclusive interview by Joe Dimino of Neon Jazz in Kansas City, Missouri. The twins talked about their background, jazz, their experience and who they are as the twin rhythm section. 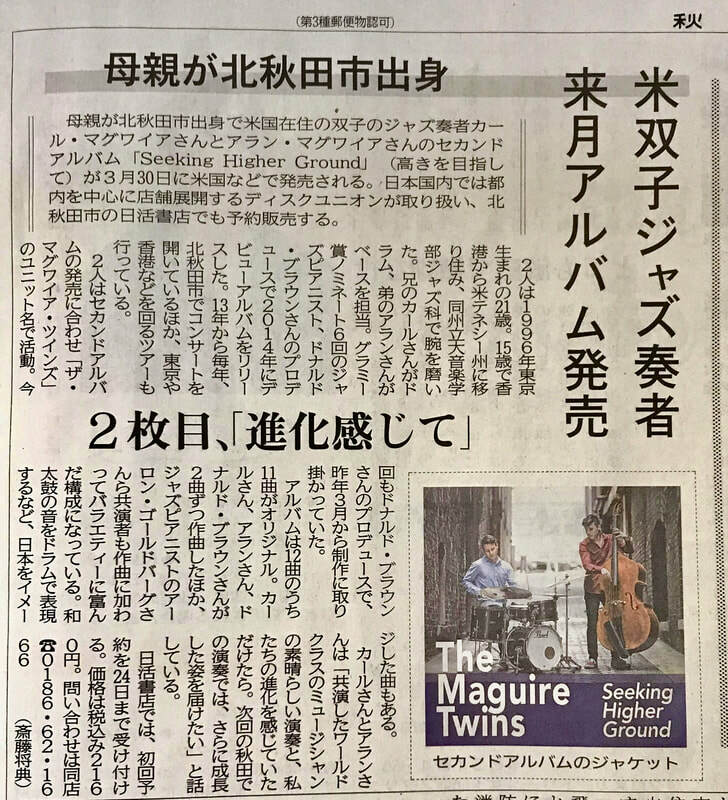 Hokuroku News, the newspaper of Akita, Japan posted an article about The Maguire Twins made it to the US Jazz Week Chart for two consecutive weeks. 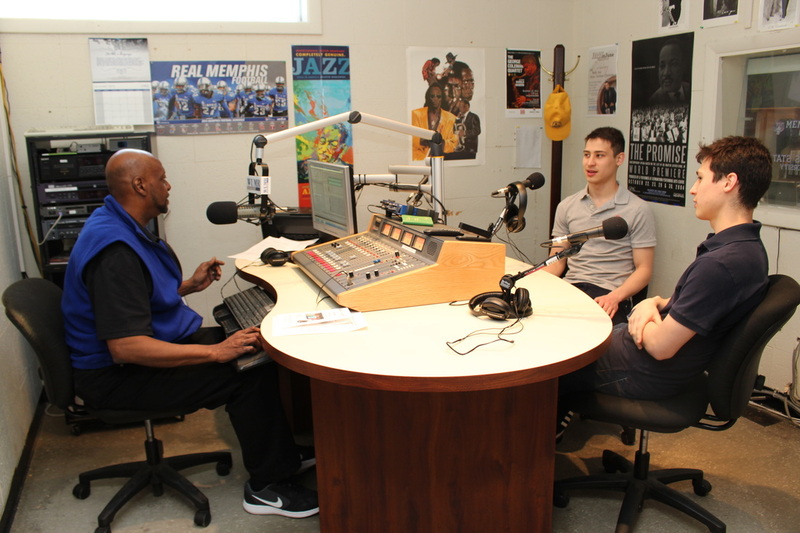 The Maguire Twins were interviewed by Malvin Massey Jr., WUMR General Manager about their CD on US jazz chart for WUMR FM92 Radiothon. Carl was at the station while Alan called in from New York. While only twenty one, identical twins Alan/b and Carl/dr show a maturity that is quite impressive on this debut album. Born in Japan and currently living in Memphis, the boys were taken under the wing of Kirk Whalum, and the mature education shows, as the rest of the band, Bill Mobleyu/tp-fh, Gregory tardy/ts-ss, Aaron Goldberg/p and Donald Brown/key focus mostly on original material that is assertive and millennially musical. 21 years old at the time of this 2017 recording, the identical Maguire twins—bassist Carl and drummer Alan—were born in Tokyo and raised in Hong Kong. In a dramatic change of scenery and culture, they moved with their parents to Memphis, Tennessee, in 2011. The brothers enrolled at the Stax Music Academy and came under the influence of bassist John Hamar, pianist Donald Brown and saxophonists Greg Tardy and Kirk Whalum. Brown is heard only on electric piano on one track. All of those musicians but Whalum and Hamar are on the twins’ debut album on their family’s label, as are pianist Aaron Goldberg and trumpeter Bill Mobley. The twins manage extremely well in that heavy company. Carl’s responsive drumming is impressive behind Goldberg on Brown’s “An Island, A Piano, and Keith,” dedicated to his son, also a pianist. Carl Maguire contributes two original compositions to the playlist, Alan one. Alan’s bass introduction is important to the success of his abstract arrangement of “Someday My Prince Will Come.” It will be interesting to follow this pair of promising rhythm players as they develop further. 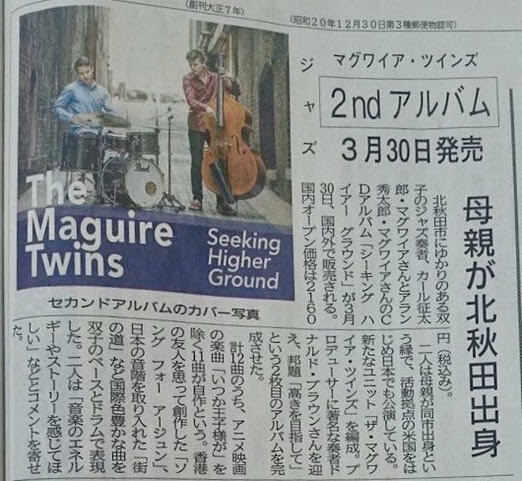 The Maguire Twins and their new album, 'Seeking Higher Ground' was featured on Jazz Japan Magazine May edition in Japan. 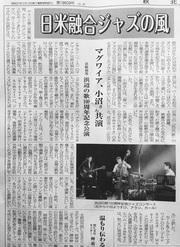 Jazz Critique Magazine, one of Japan's national jazz magazine featured The Maguire Twins and their upcoming CD release. It has 3 whole pages! 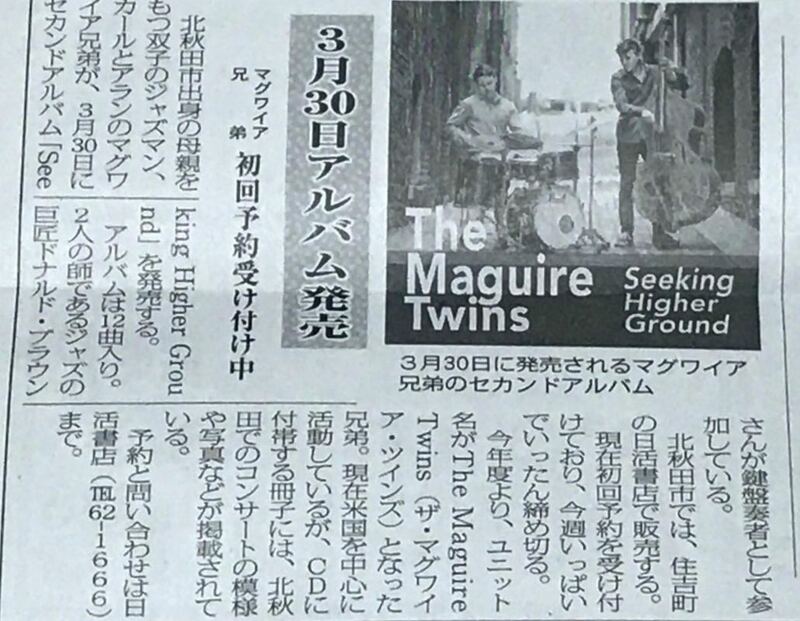 Hokuroku Shimbun Newspaper in Akita, Japan had an article about The Maguire Twins' second album. 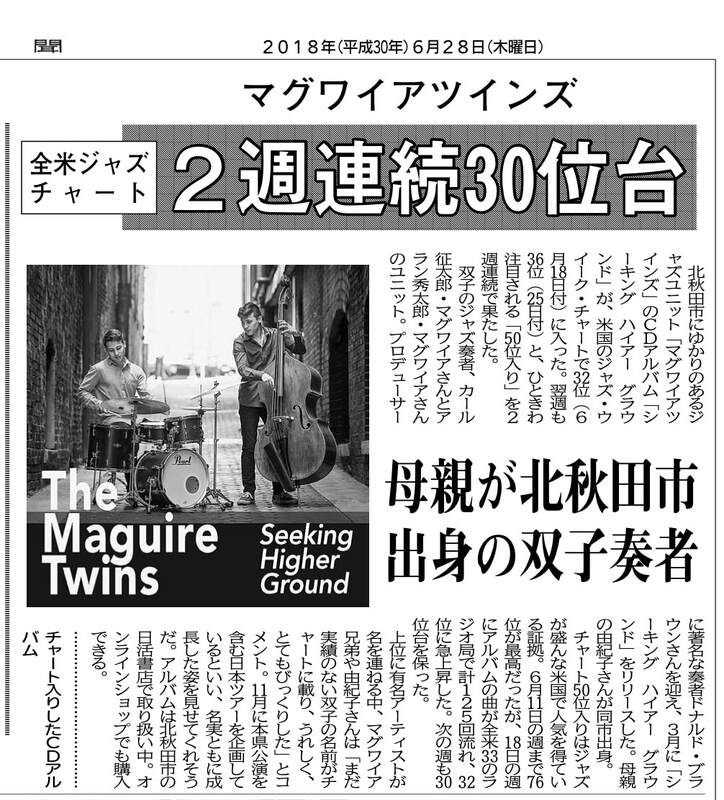 The article about the release of The Maguire Twins' second album, 'Seeking Higher Ground' on Akita Sakigake Shimpo newspaper. 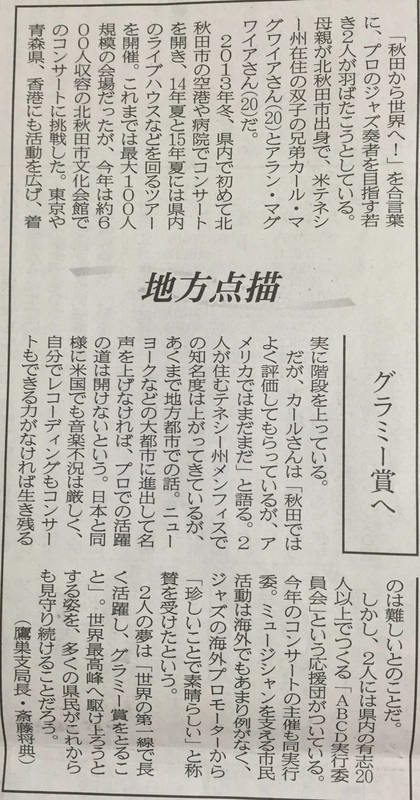 The release of the album, Seeking Higher Ground was announced on Shuhoku Newspaper in Kitaakita, Japan. The first review of 'Seeking Higher Ground' has arrived! The Feature CD of the Week is a Memphis project, by way of Hong Kong. The album is titled Seeking Higher Ground and it is by Carl Shutaro Maguire (on drums) and Alan Shutaro Maguire (on bass). This second project by The Maguire Twins has been long awaited. They came into the jazz world by way of the Stax Academy, University of Memphis, and U.T. Knoxville, which they are three of the best music programs in Tennessee. Their first CD, The Sound Of Music, was received with great fanfare on its release, and it featured artists like Kirk Whalum and Donald Brown among other stellar artists. The new project is another strong display of skill and innovation. As with the first album, Producer Donald Brown and Executive Producer Yukiko Maguire (mom and manager of the guys) have enlisted the talents of another crew of major players: Bill Mobley on trumpet, Gregory Tardy on sax, and Aaron Goldberg on piano, with Donald Brown playing a Fender Rhodes on one track. All but one of the tunes on the disk are originals, penned by all the artists individually. It is truly a straight ahead jazz jewel that will be a very entertaining Feature CD. 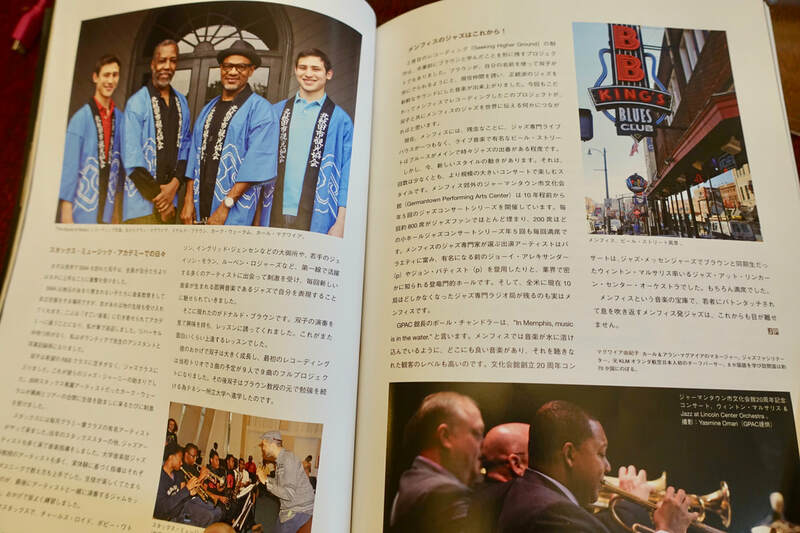 Japan's premier jazz magazine, Jazz Perspective vol 15 Jazz in USA has an article 'Memphis Jazz Sprits'. It includes The Maguire Twins' jazz journey in Memphis. 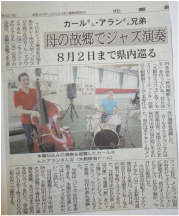 Carl Maguire and Alan Maguire's jazz concert was held at Kitaakita Area Exchange Center on July 29, 2017. Their perfectly synchronized performance captured the paced audience. 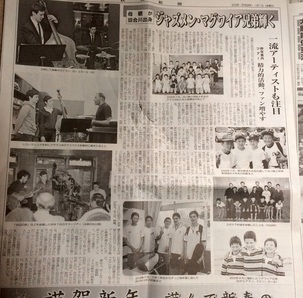 The Challenge Concert was on an article on Shuhoku Newspaper. 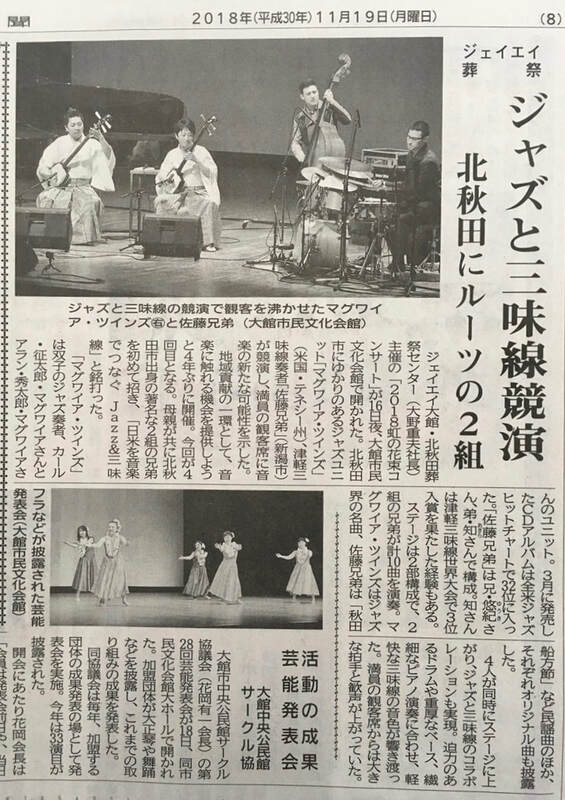 It says that we are challenging world starting from Kitaakita where we started and the audience enjoyed our sound. Carl & Alan's interview article talking about jazz and what their goals in music are. Jazz isn’t dead, says International Jazz Twins Carl and Alan Maguire, when they stopped over in Hong Kong on their Asia tour earlier this month. ​When Ryan Gosling’s character in the critically acclaimed La La Land, Sebastian, declared that “jazz is dead”, it sparked an intense music debate over the current direction of the genre. 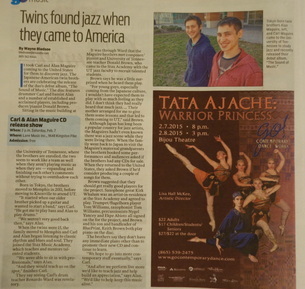 The quote, however, prompts laughter from Carl and Alan Maguire, two internationally recognised 21-year-old jazz twins, now touring around Asia. Born in Tokyo to an American father and a Japanese mother, but raised in Hong Kong, the twins went to South Island School before later relocating to Memphis, Tennessee in the United States. The two discovered their love for jazz after joining the world-renowned Stax Music Academy, with Carl picking up the drums and Alan, the bass. After they were discovered by Grammy Award nominee Donald Brown, the twins are now writing their own international success story, and have released an album, and embarked on several international tours. This summer, the Maguire twins are touring Asia, and have performed several shows in Hong Kong and Japan. Young Post caught up with the Maguire’s on their stop in the 852 earlier this month. Carl: We used to be in a rock band back when we were in South Island School. We didn’t know anyone to jam with when we moved to Memphis, so we decided to join this famous music academy called Stax that specialised in soul music but also touched on jazz. It was pretty difficult at the start – it was filled with a lot of inner city kids, and we were the only non-black students in the programme. But everyone was so talented and encouraging, and it was there we learned to truly love jazz. How supportive were your parents of your musical venture? Alan: Our parents were both incredibly supportive of us. I remember the second that my bass teacher told us having an upright bass would double the number of gigs we could get, my mum drove me to Nashville, which was three hours away, to buy an upright bass. I know most Asian parents tend to be sceptical of their children pursuing an arts career but without the kind of support our parents have given us – accompanying us on tour, driving us to practice, and helping us find gigs – we wouldn’t be where we are today. Our mum is pretty much now our manager. What was it like to record your first album? C: It was pretty amazing. We got to record in a legendary studio in Memphis, where famous artists like The White Stripes, MIA, Isaac Hayes, and Dave Matthews had recorded stuff. We got to work with some inspiring musicians as well, including [Grammy Award winning Jazz artist] Kirk Whalum and Donald Brown. They gave us great advice that helped us grow as musicians. How does your Hong Kong upbringing influence your music today? A: We discovered music here after we formed a band with classmates in South Island School, and Carl and I used to practise after school at home, and we took lessons at Musicland in Causeway Bay. All of was a great introduction to music. How would you classify your music style? C: We tend to play a blend of traditional and contemporary jazz – but we also incorporate many other genres into our music. For example, sometimes we’ll add elements of hip hop, drum and bass, Latin, and many more genres into it. Because we’re based in Memphis, we’ve also been inspired by soul, R&B, gospel, and blues music too. There are only two of us, so we have different guest musicians join us, and a lot of what we play depends on who is with us that day. Any advice for readers who would like to be musicians? A: Play with people better than you. We improved as musicians by joining a music academy filled with people that were more talented than us. By playing with, and sitting in on sessions with, these more experienced musicians, we were forced to raise our game. 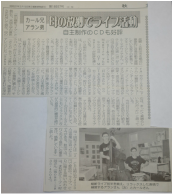 Carl & Alan were featured in Hokuroku Newspaper New Year Special Edition as emerging artists. "From Akita to the world!" 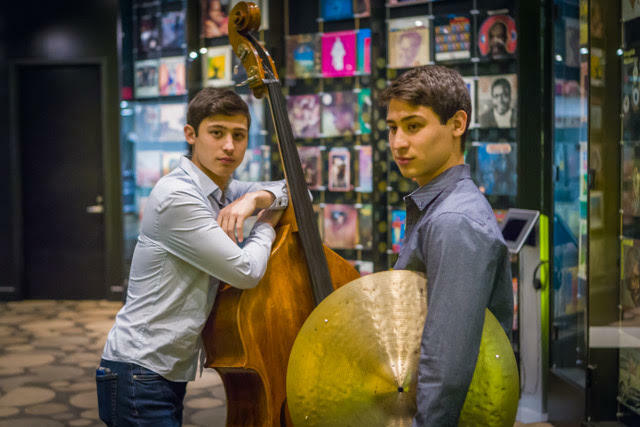 , with this phrase in their mind, two young jazz musicians are ready to take off. They are Carl Maguire (20) and Alan Maguire (20) who has a mother from Kitaakita City and currently reside in Tennessee, USA. In 2013 winter, they had concerts at the airport and a hospital in Kitaakita City, performing in Akita Prefecture for the first time. In 2014 and 2015, they toured throughout the prefecture performing at live houses and other venues. They performed at the venues for up to 100 people so far. This time they challenged to have a concert at Kitaakita City Cultural Center which houses 600 hundred people. They expanded their territories and performed in Tokyo, Aomori and Hong Kong. They surely are on their way. Carl says, ‘They value us in Akita, but we are not there yet in the United States’. They are getting popular in Memphis, TN where they live, but it’s after all a local city. He says the road to the success will not be open unless they make their names in big cities such as New York City. The recession of music industry is severe in USA like in Japan and they won’t to be able to survive unless they are capable to do recording and concerts by themselves. However, the two young guys have a cheering squad ‘ABCD Executive Committee’. The committee organized the concert this year. A civic activity to support individual musicians is not common even overseas, some top professional jazz promoter told them it was rare and great. The dream of these young men is ‘To perform as top musicians for a long time and win a Grammy Award’ Many citizens in Akita Prefecture will continue to witness them running to the highest peak of the world. 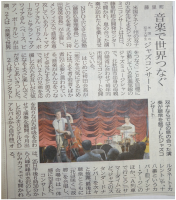 Carl Maguire (20) and Alan Maguire (20), the twin jazz musician, whose mother is from Kitaakita City, and now residents of Tennessee, USA, had ‘ Hamabe no Uta 100th Anniversary Concert’ at Kitaakita City Cultural Center in the evening of July 3rd. 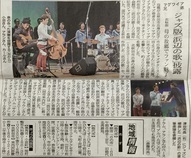 They played with Yosuke Onuma, the renown jazz guitarist from Akita who is active both nationally and internationally. The trio created the sound of jazz which unites Japan and America and captivated audience of about 400 people. They played 9 songs including ‘Hamabe no Uta’ composed by Tamezō Narita ( 1893-1945 ) as well as Alan’s original songs. ‘Hamabe no Uta’ was arranged by Donald Brown, 6 times Grammy Award nominee, who is now their professor. Akita Mixed Voice Chorus joined them and the audience sang along. They also performed ‘Kanariya’, another composition of Tamezo. They wowed the audience with the up-tempo song. In the middle of the concert, the Maguire brothers presented the original arrangement score by Donald Brown to Mayor Eiko Tsuya of Kitaakita City. Carl said ‘Please exhibit this at Hamabe no Uta Museum (Yonaizawa, Kitaakita City)’. Maguire brothers were born in Tokyo, raised in Hong Kong and moved to USA at age 15. Their father is American. They released their debut album production ‘The Sound of Music’ produced by Donald Brown in 2014. Carl plays the drums and Alan plays the bass. The album is now available for sale in Japan. Carl and Alan, the Maguire brothers from the holy music city of Memphis, Tennessee in USA had Hamabe no Uta 100th Anniversary Jazz Concert with Yosuke Onuma, the world renown guitarist. Yosuke Onuma is from Noshiro City, Japan. The hot wind of US-Japan jazz blew at Kitaakita City Cultural Center Concert Hall which was packed full with an audience who did not want to miss their real deal performance. Maguire Brothers, now 20 years old, are Carl (drums) and Alan (bass). Their mother is from Aikawa Town and their father is from USA. They actively tour the world while studying at the University of Tennessee, under Donald Brown who is a renown jazz master and professor. They met Yosuke Onuma at his concert at Atrion Concert Hall in Akita City last summer and that brought them together to perform this time. On that day, they played 4 songs in the first set, ‘The Taimi’ composed by Alan and arranged by Carl and Alan both, followed with ‘Sakura’ , ‘Sisters of Aomori’ and ‘Hamabe no Uta (Song of Seashore) by Tamezo Narita arranged into jazz. The second set started before the excitement of the first set was gone. 20 members of Akita Mixed Voice Chorus lead by Yumiko Misawa opened the set to heated up the hall. After the world premier of ‘The Elements’ composed by Yosuke Onuma, the trio played ‘Kanariya’ by Tamezo Narita followed with Alan’s ‘Song for Arjun’. The audience clapped their hands along their performance naturally even though most of the audience was not familiar with jazz. The encore piece was ‘Forest Flower’ by Charles Lloyd, the renown saxophonist from Memphis. When they played in the style of call and response or when they played solos, the audience applauded passionately and the venue became hot. Before the concert, Carl and Alan said, ’We would like to cherish the first performance which never has the second chance and we would like to gain more new fans.’ After the concert, they said, ‘ There was great energy at the venue. We really appreciate that so many people came out. We thank all the staff, too’. Carl & Alan • CD "The Sound of Music" of Maguire is now on sale. Yosuke Onuma’s 10th album which includes ‘The Elements’ which the trio played today will be released this fall. 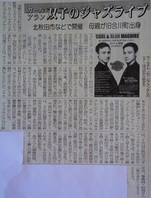 Carl & Alan's Hong Kong performances were introduced on Hong Kong Localize, Hong Kong Entertainment Web Magazine. ​Click the photo to view the article. 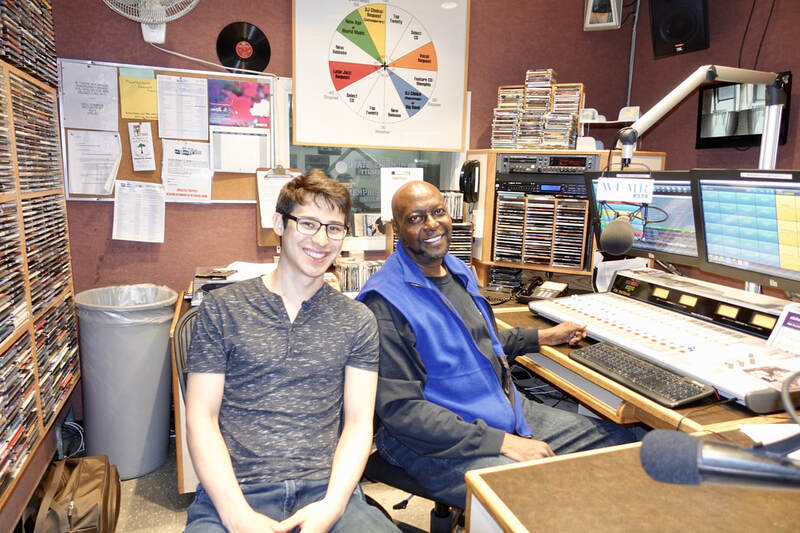 Carl & Alan were back at WUMR FM92 radio station for 'Focus on Arts' interview with Malvin Massey to talk about their upcoming show, next recording project, and touring in Japan and Hong Kong, etc. Carl & Alan were back on Live@9 morning show on WREG, Channel 3 in Memphis, TN. They played live to promote their concert of Levitt Shell's #5 Fridays of Jazz @ Memphis Central Library on March 18, 2016. Click the photo to view the TV segment with their live performance. 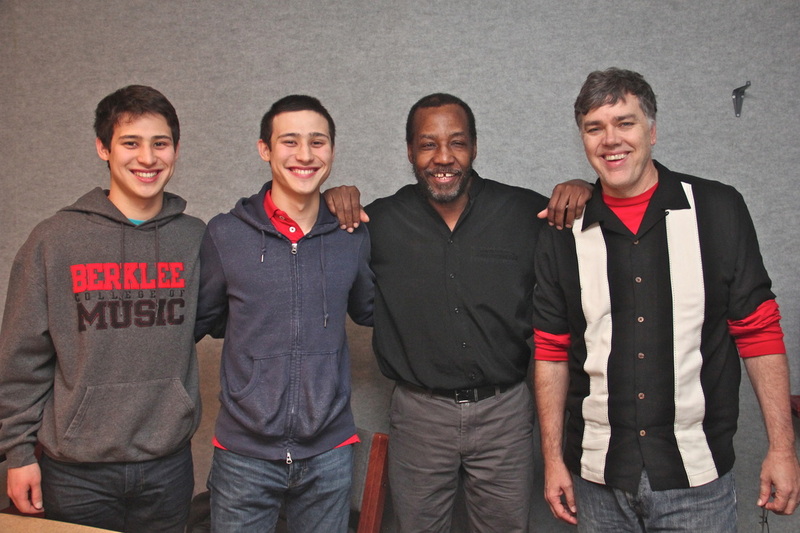 Carl & Alan were invited to play live for Earle Farrell Show at KWAM990 in Memphis. The legendary radio station of Memphis has been known for having live perfomances of local musicians including Elvis Presley, BB King, etc. It was a truly honorable moment for Carl & Alan to be a part of it. Up-and-coming twin jazz musicians from USA, Carl Maguire (drums) and Alan Maguire (bass) are taking jazz scenes by storm. Last year, the twins who have a Japanese mother from Kitaakita City, toured throughout Akita Prefecture with their ‘Summer Tour 2015 in Akita Jazz Live’. They performed at 16 venues in Akita Prefecture including Kitaakita and made more new Japanese fans. Those two young musicians who have their roots in Kitaakita City, now attract top artists attention and are expected to go further with their achievements. Carl’s Japanese name is ‘Seitaro’ and Alan’s is ‘Shutaro’. They are identical twins who have American father and Japanese mother. They will be 20 years old in March. They were born in Tokyo and raised in Hong Kong since age 3. They were interested in music at their young age. At age 9, Carl started to play drums and Alan bass guitar. Once in Memphis at age 15, the Maguire’s found their love in jazz at the world-renowned Stax Music Academy and started to study music seriously. After their performances in Akita, their second home town, in winter 2013 were well received they decided to record their first album. Their debut album “The Sound of Music’ was released in July, 2014. The nine-song CD does not include only jazz standards but also a jazz arrangement of “Hamabe no Uta” (Song of Seashore), a popular Japanese tune composed in 1916 by Tamezo Narita. It was arranged by Donald Brown who is a 6-time Grammy nominee as well as renown jazz pianist and a professor. The album also included ‘Sakura’ which is a renown Japanese classic tune arranged by Alan. This album was produced by Donald Brown who discovered the twins during a recruiting visit at Stax Music Academy in 2013. Mr. Brown also played on 4 song of the 9 songs. Moreover, Kirk Whalum, who has been the twins inspiration while he was the artist in resident at Stax, played 3 songs as a guest artist on their album. Back in Japan in 2014, they have toured ‘Akita Longitude Live’ to promote their CD at 10 venues throughout Akita Prefecture starting in Odate Jukai Dome. In USA, they held successful CD release parties in Memphis in December 2014 and Knoxville in February 2015. They were featured artists to play Japanese music with jazz arrangements for the Japan-America Society of Kentucky at the Kentucky governor's mansion in January 2015 and promoted Japan-America friendship. In July 2015, they toured 16 venues throughout Akita Prefecture as part of their ‘Carl & Alan Maguire Summer Tour 2015 in Akita Jazz Llive’ with a catch phrase of ‘From Akita to the World!’ They impressed the audiences by showcasing their remarkable progress made in a short period time to make more presence in the jazz world. This tour was supported by 25 ABCD Committee members who volunteered to plan and execute their tour. ABCD stand for A for Alan, B for Bass, C for Carl and D for Drum. The committee was named ABCD also because it is the first 4 letters of alphabet, which signifies ‘the beginning’ while the committee members see ‘the hope for the future’ in two young men. The hand made tour created by the committee and many other fans was a big success. All the work in setting up venues, getting audiences, finding sponsors, etc., were all done by volunteers and that made the tour even more memorable. 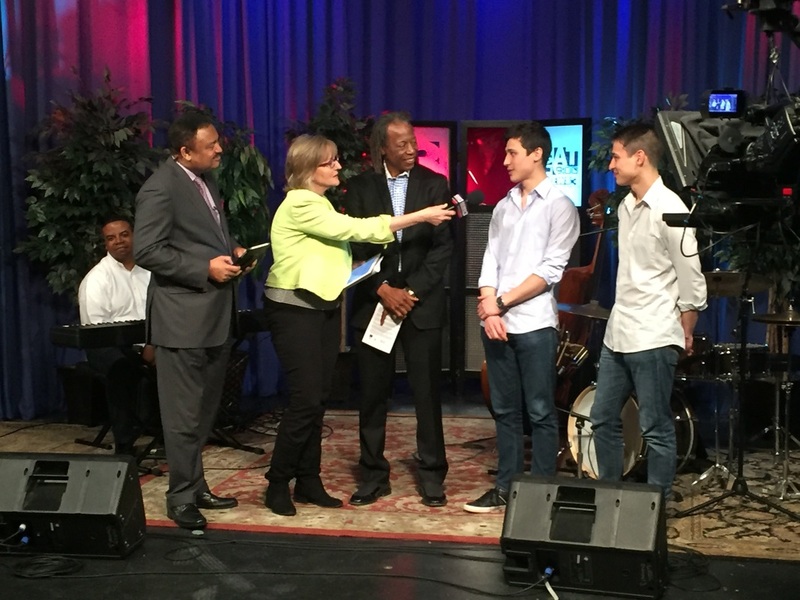 In August 2015, they made an appearance at the Knoxville Jazz Festival as the youngest artists at the age of 19. As they came to attention to many top musicians, they have received many positive comments from many renown artists both overseas and in Japan. These two Japanese/American kids are the real deal! They are twins and make a solid foundation for any rhythm section. Carl & Alan's interview and Carl & Alan Maguire Sextet Performance was broadcasted on Knoxville Cable TV. Click the image left to view the segment. Carl Maguire and Alan Maguire, US jazz musicians’ live concert was held at Futasui Community Center in Futatsui, Noshiro. Their mother is from Kitaakita City. They captivated the audience of 70 people playing jazz including renown ‘Hamabe no Uta’ (Song of Seashore) with jazz arrangement as well as their original song. 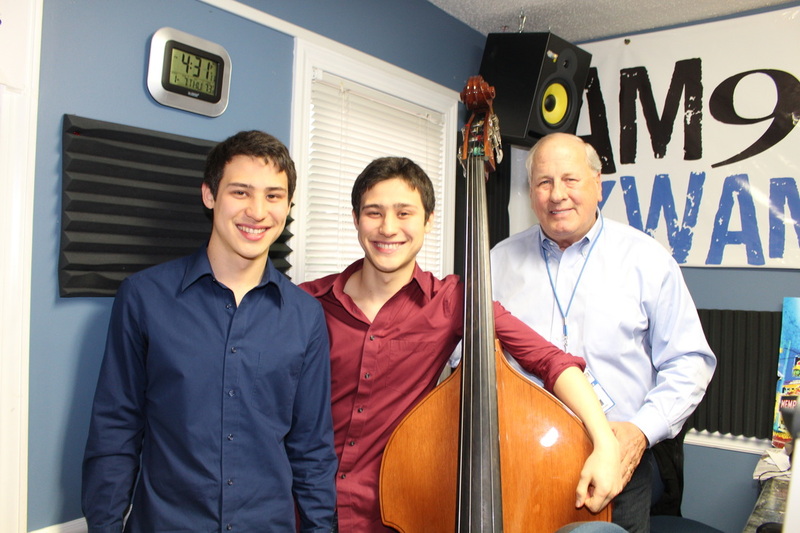 Carl (drums) and Alan (base) are 19-year-old twins who study jazz at University of Tennessee Knoxville in US. 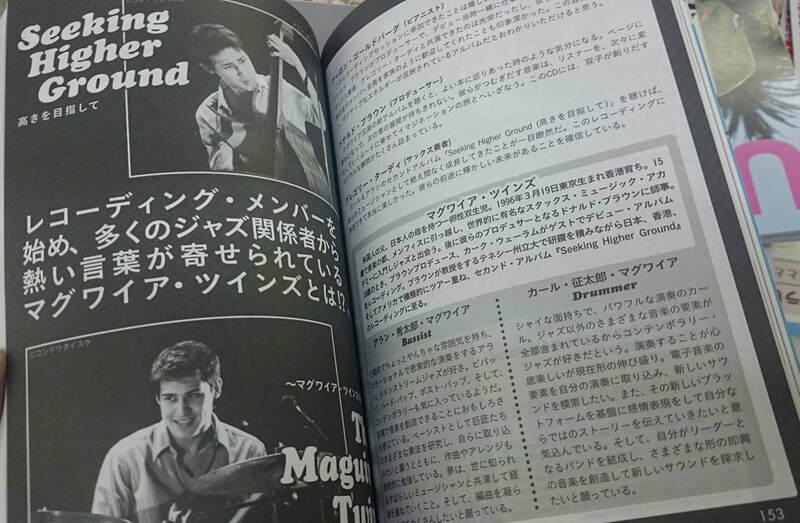 They are touring ‘Carl & Alan Maguire Summer Tour 2015 in Akita Jazz Live’ performing at 14 venues till August 2nd. They performed in Futatsui, where Tamezo Narita, the composer of renown song, ‘Hamabe no Uta’ (Song of Seashore) grew up from age 4 till age 17. They have included ‘Hamabe no Uta’ with jazz arrangement in their CD they recorded last year. ‘Bug’s Groove’ by Rintaro Ono, the guitarist from Akita City, Hirotaka Kikuchi, the guitarist from Noshiro City performed for the first set. The main set was by the trio consisting of Carl, Alan and Rintaro Ono. They played ‘Hamabe no Uta’ as well as Alan’s original piece. The audience enjoyed their live performance moving their bodies along the rhythm of the music and responded with the big applause for the passionate performance. The tour is organized by ABCD Committee. Their next live will take place at The confectionery Espoire’s open air event in Shimizutai in Fujisato Town. A jazz concert was held at Akamatsuan, a Japanese traditional Magariya style house at a hot spring resort inn in Daisen City on July 22nd. About 60 people enjoyed the live performance. Akamatsuan was opened in 1997. It is now owned by the Daisen City and Warabiza is in charge of management. Its small private house atmosphere is popular and this concert was planned in order to broaden its usage for variety of events. The performers were twin jazz artists, Carl Maguire on drums and Alan Maguire on bass. They have a mother from Kitaakita City and a father from United States. Performance was showcased in the parlor surrounded with old fashioned paper doors and the audience enjoyed the powerful performance up close. Noriko Kanno, the public relations director of Warabiza said, "This concert was in a nice traditional house which can create warm sound. We can also take advantage of this place to be use for variety of events in addition to use it as accommodation." Summer tour 2015 in Akita Jazz Live will be held in Futatsui where Tamezo Narita grew up on July 29th. US jazz artists, Carl Maguire and Alan Maguire's live show will be held at Futatsui Community Center in Noshiro City at 6pm on July 29th. Their mother is from neighboring Kitaakita City. They will be performing jazz numbers including ‘Hamabe no Uta’ (Song of Seashore) by Tamezo Narita with jazz arrangement in the place where the composer grew up. 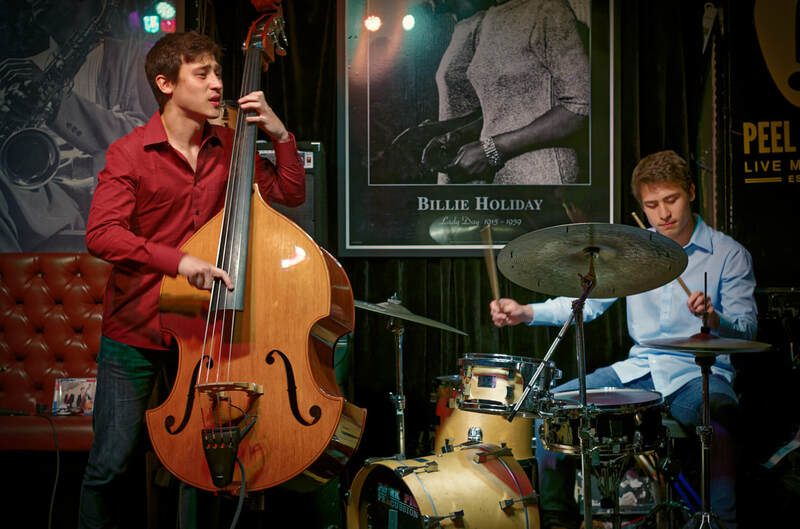 Carl, the older brother (drums) and Alan, the younger brother (bass) are 19-year-old twins who study jazz performance at University of Tennessee in the US. They visit their grandmother who lives in Kitaakita City regularly and they held concerts when they visited her last summer. They also released their first jazz CD, which includes “Hamabe no Uta’ specially arranged for them last year. This summer, they are staying in Akita Prefecture from July 8th till August 3rd to their ‘Summer Tour 2015 in Akita Jazz Live’ tour. In Futatsui, they will perform with a guitarist, Ricardo Rintaro Ono. Alan says, ‘ Our ‘Hamabe no Uta’ starts with original melody, but it becomes a new song with a lot of Memphis, Tennessee’s sound in it.’ And he hopes that many people will come to their concert in Futatsui where the composer, Tamezo Narita spent many years. 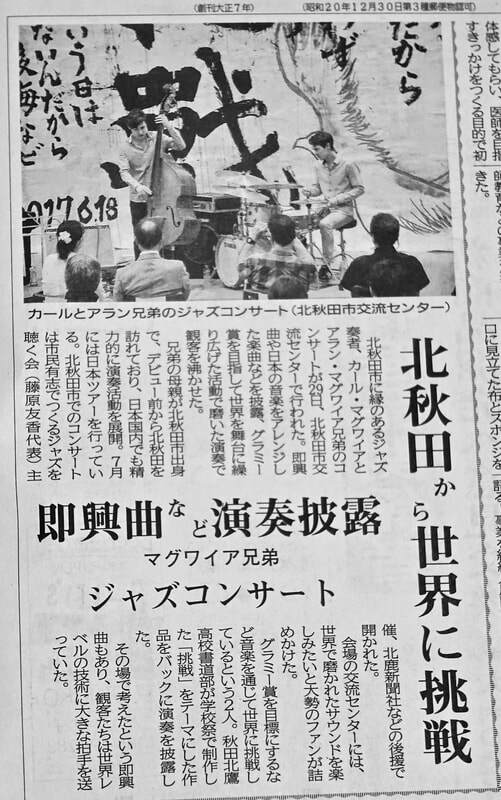 Live jazz by emerging jazz musicians, Carl Maguire (drums) and Alan Maguire (bass) was held at packed Hokuo-no-Mori Park Center in Kitaakita City and more than 80 people enjoyed the sound of jazz. Their mother is from Kitaakita City. 19 year old twin brothers, Carl and Alan were born in Tokyo and raised in Hong Kong. They have visited Aikawa where their mother is from and they have spent summers going to Aikawa Higashi Elementary School and Aikawa Junior High School. They are currently studying jazz performance at University of Tennessee. This tour was organized by ABCD Committee made of volunteers from Akita Prefecture to support their tour. (Secretariat = Kitaakita Machinaka Tobu). During this tour, they perform with local musicians. At this concert, they formed a trio with Ricardo Rintaro Ono and performed jazz standards as well as ‘Hamabe no Uta’ (Song of Seashore). The local band, ‘Midnight Sugar’ opened the show. They are inviting people to participate in their crowd funding project in order to support their tour. Their tour continues till August 2nd and they are scheduled to perform at 14 venues. Within Kitaakita City, they will have performances at Ani Furusato Culture Center and Ani Ekimae Summer Festival on 25th, Moriyoshi Shikibi Lake on 26th and Machinaka Tobu on 31st. For details, please visit their website, http://www.carlalanmaguire.com/. Carl Seitaro Maguire (19) and Alan Shutaro Maguire (19), twin jazz artists whose mother is from Kitaakita City, had a live performance at Kazuno Exchange Plaza on July 16th. 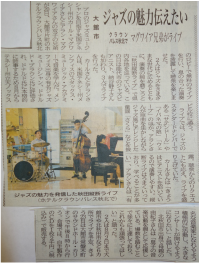 They showcased genuine jazz from USA and entertained many citizens in Akita where they have family roots. 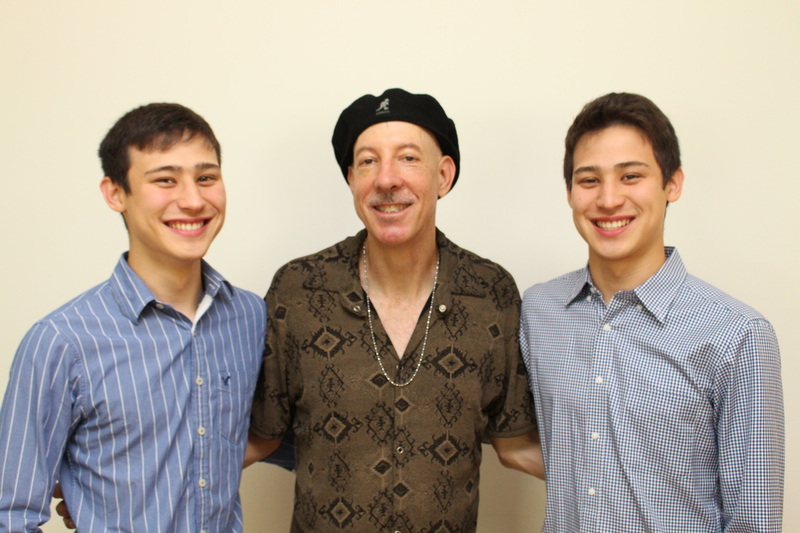 Carl and Alan were born in Tokyo with their American father and Kitaakita-born mother. They have experienced Aikawa Higashi Elementary School and Aikawa Junior High School during summers. Now they are students of University of Tennessee in US. They were recognized by a famous jazz musician and recorded their original album which includes “Hamabe no Uta’ (Song of Seashore) composed by Tamezo Narita from Kitaakita City. This live show was a part of their 14 performances of their ‘Summer Tour 2015 in Akita’. They are touring throughout Akita Prefecture to showcase their music for Akita citizens. ABCD Committee, which consists of Akita citizens, organized the tour to support them. The tour kicked off in Akita City on July 12th and Kazuno City was the first place in northern Akita. The older brother, Carl, played drums and the younger brother, Alan, played bass. They played 7 numbers from jazz standards and their original song. They also played with a local pianist, Toshio Fujii (66). They wowed the audience with their powerful and synchronized performance with authentic technique they obtained where jazz came from (Memphis, Tennessee). After the show they also had a jazz workshop. Another live show was held at the Coffee and Jazz Café KOW in Odate City in the evening of July 17th. They will perform at Hokuo-no-Mori Park Center in Kitaakita City on the 18th at 3pm. They will also plan to perform at various venues in Kitaakita City on 25th, 26th, 31st. For more details, please refer to their website and Facebook page. Twin jazz artists held a live performance at ‘THE CAT WALK’ in Omachi, Akita City on 12th. They showcased 13 songs and about 30 audience members were blown away with their performance. The older twin, Carl Maguire (19, drums) and the younger twin, Alan Maguire (19, bass), have both just finished their second year at University of Tennessee in US. Their father is from US and their mother is from Kitaakita City, Japan. They played as a quartet with Ricardo Rintaro Ono (24, guitar) from Akita City and Yudai Suzuki (28, trumpet) also from Akita City. They played jazz numbers including ‘Hamabe no Uta’ (Song of Seashore) with jazz arrangement and "Girl from Ipanema" a bossa nova standard and received a big applause. The purpose of the live tour is to play with local artists and gain more fans throughout Akita Prefecture and they have been touring since 2 years ago. The tour Committee consists of citizens that are supporting them. This year, they will perform at 14 venues until August 2nd. Carl said, “I like playing with Akita artists. It is inspiring.” Alan said, ‘I would like to make the future successful and gain more fans.”. For more details, please refer Carl & Alan’s website (http://www.carlalanmaguire.com) and their facebook page. Emerging twin jazz musicians, Carl Maguire (drums) and Alan Maguire (base), are touring on their "Summer Tour 2015 in Akita Jazz live" which kicked off in Akita City on July 12th. They will perform at 14 venues including Kitaakita City, where their mother comes from. They toured Akita on their ‘Akita Longitudinal Live 2014’ last year and the audience can now enjoy their performances to see their growth this year. Carl's Japanese name is "Seitaro" and Alan's is "Shutaro". They are identical twins born with American father and a Japanese mother. 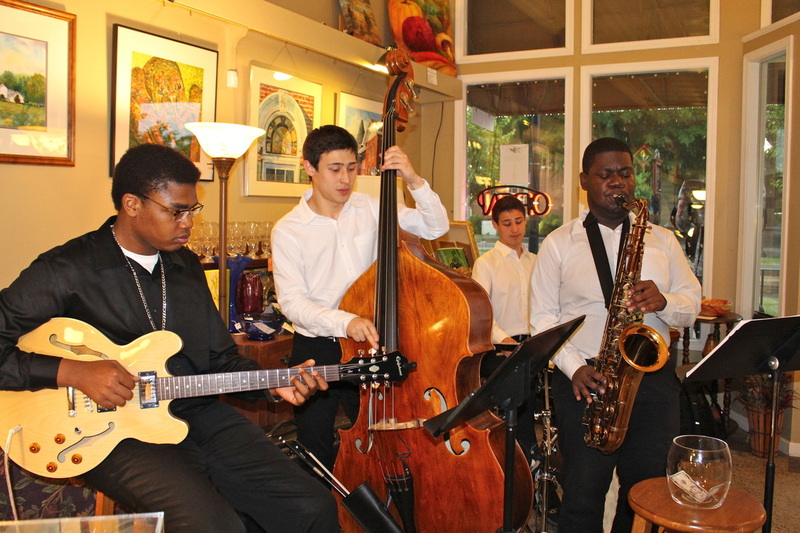 They are 19 years old and currently studying jazz at University of Tennessee Knoxville School of Music. The twins, whom famous jazz artists pay attention to, had a tour last year. ‘Akita Longitudinal Live 2014’ throughout Akita Prefecture including Kitaakita City was carried out during their summer holiday last year and it was well received. Also, they released their own CD with famous jazz artists. This 9 song album includes ‘Sakura’ (Cherry Blossom}, a Japanese classic tune with Alan’s jazz arrangement and Joe Henderson’s classic ‘Inner Urge’ arranged by Carl as well as ‘Hamabe no Uta’ (Song of Seashore), a famous Japanese classic tune composed by Tamezo Narita from Kitaakita City and arranged by Donald Brown, an associate professor of their university, who is also a famous jazz artist. The album has been drawing people’s attention since their CD has been sold at Warabi-za where ‘Tamezo-san’, a musical show of the celebration of the life of Tamezo Narita. This summer tour is organized by ABCD Committee consist of local volunteers including people from Kitaakita City. (Secretariat = Machinaka Tobu) with the support of sponsors from neighboring companies and individuals. 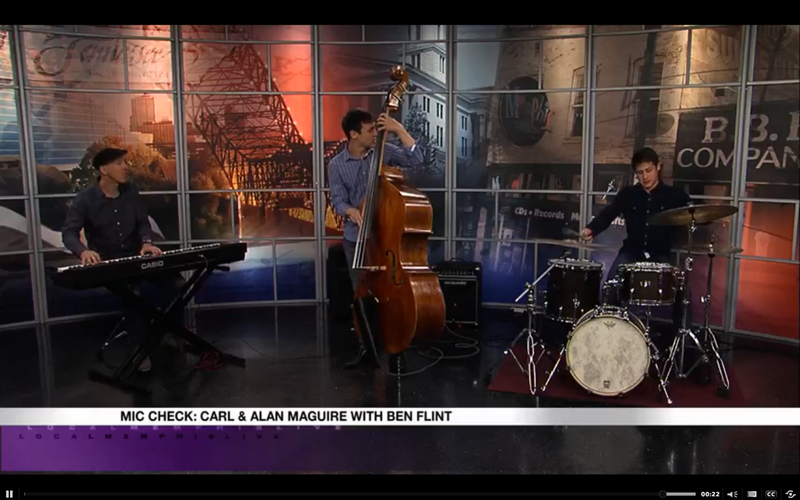 Carl & Alan were back on Channel 24's Local Memphis Live. This time, they performed with Ben Flint to promote their concert on June 13 at Lane Music Germantown. Ben Flint, who toured around the world with many famous artists including Isaac Hayes will produce the concert. Carl & Alan's home coming performance at Stax Museum was introduced with their story on Memphis' Commercial Appeal newspaper. Click the photo to view the full coverage. Their story is in the middle section. Check on Carl & Alan's interview and performance video on Memphis Commercial Appeal newspaper. Click the image to view the interview. They talk about Stax, jazz and their international background. Jackson Sun newspaper had an article about 'Carl & Alan Maguire and Friends Band'. The CD of Carl & Alan Maguire, twin jazz musicians whose mother is from Kitaakita City, will be featured as BGM at Tazawa Lake Brewery Restaurant in Tazawa Lake Art Village, Senboku City on April 30th. The CD includes well known ‘Hamabe no Uta’ (Song of Seashore) composed by Tamezo Narita from Kitaakita City. Carl and Alan are currently studying at a university in Tennessee aiming to become professional jazz musicians. They have visited their mother’s home town since they were young. They have been performing actively in Kitaakita City, Odate City as well as the Hokuroku region in the last few years. Carl & Alan’s CD which includes ‘Hamabe no Uta’ will be featured as Tazawa Lake Brewery Restaurant’s BGM as the part of ‘International Jazz Day’ established by UNESCO on April 30th. Warabiza Theater, which is also a part of Tazawa Lake Art Village as well as the brewery restaurant, is now presenting a musical show, ‘Tamezo-san’, which celebrates the life of Tamezo Narita. Click the video to view the segment. 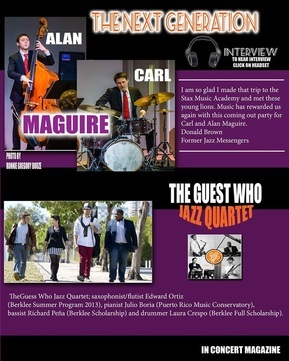 Carl & Alan were introduced as the next generation on January 'In Concert' magazine, an on-line jazz magazine. Please click the photo to hear their live interview to visit the page 41 of the magazine's website. Carl & Alan appeared on Channel 24 Memphis' 'Local Memphis Live @ 9' on December 22nd to talk about their coming CD 'The Sound of Music' release party scheduled on 27th 2-4pm at Lane Music in Germantown, TN. Followed was Carl & Alan Quartet's performance of 'Softly, as in a Morning Sunrise' from their CD with some Christmas melodies. The segment was broadcasted again on their Christmas Eve Special on Dec 24th. 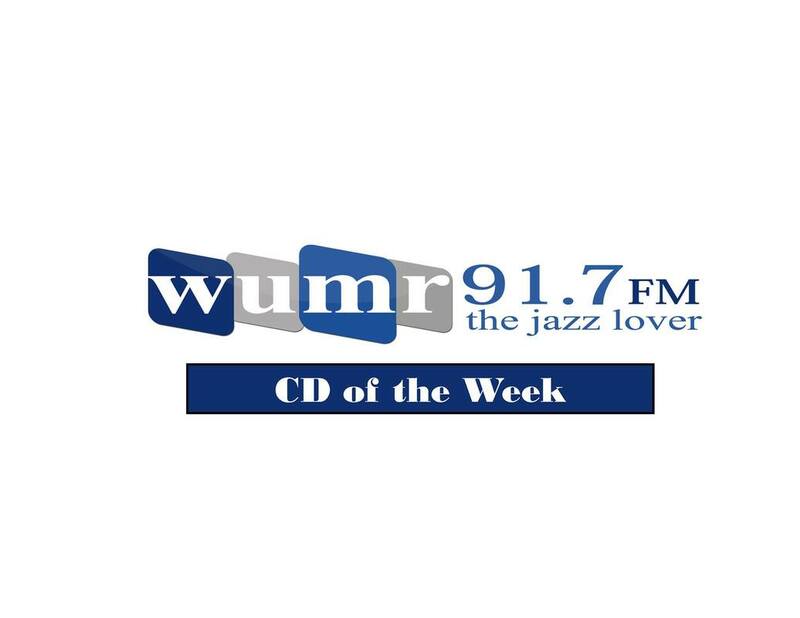 Feature CD Of The Week: Carl & Alan Maguire's "The Sound of Music"
The Feature CD of the Week this week is an album with a definite Memphis connection. It isThe Sound of Music by Carl & Alan Maguire. 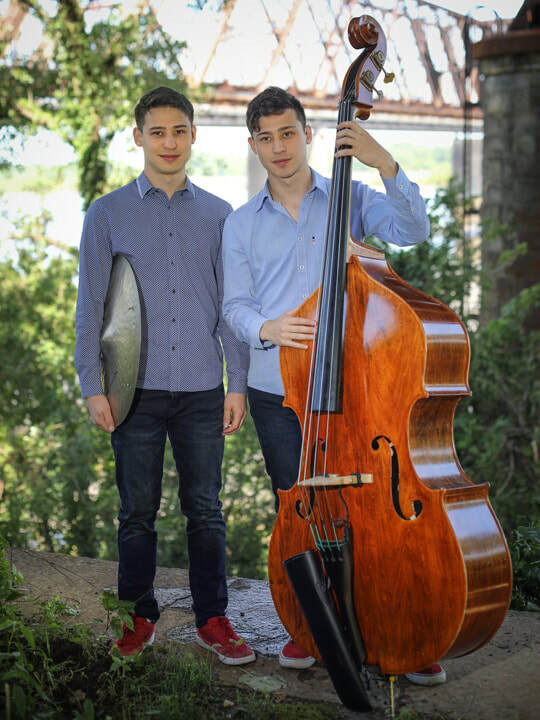 The 18 year old identical Maguire twins, Carl on drums, and Alan on bass, were born in Tokyo and raised in Hong Kong and now study music in America. They found their passion for jazz at the Stax Music Academy in Memphis under the tutelage of the great Kirk Whalum. 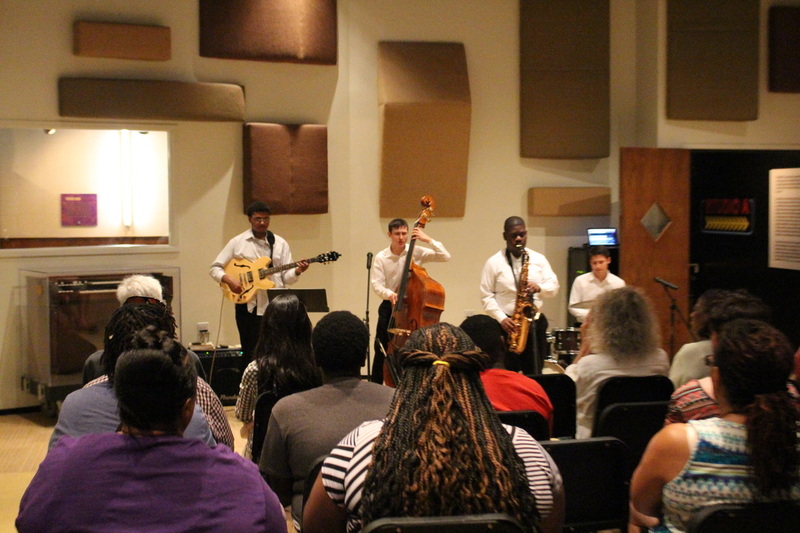 They have also studied jazz at the University of Memphis, and soon plan to continue their studies with the great Donald Brown at UT Knoxville. The idea to produce a full album was Donald's idea as he was so impressed with the skill and jazz feel that these two young musicians possess. Through the tireless efforts of their mother and producer Yuki Maguire, and the force of Donald and Kirk, this CD is a professional, straight ahead effort worthy of a feature. The band is comprised of a stellar crew of Memphis musicians including Kirk Whalum, Donald Brown (who arranged most of the tunes), Don Aliquo, Keith Brown, Tom Williams and others. The title tune, and arrangement of the theme from the movie classic "The Sound of Music," is a perfect example of the musical innovations of which jazz is capable. These guys are off to a great start at an early age, and we are happy to share their talent with the rest of the world. Carl & Alan Maguire, who are enthusiastically going around with their ‘Akita Longitudinal Live!’ through Akita Prefecture, are experiencing good sales of their CD that was just released. World-renowned jazz musicians who saw their talent joined them to record. Their producer and renowned jazz pianist, Donald Brown who is also an associate professor of University of Tennessee; as well as Kirk Whalum, a Grammy Award winning saxophonist, and other established musicians helped them to make the recording last May. The CD consists of 9 songs and it includes a Japanese classic tune ‘Sakura’ (Cherry Blossoms) arranged by Alan, and Joe Henderson’s classic ‘Inner Urge’ arranged by Carl. Moreover, the Japanese popular classic tune, ‘Hamabe no Uta’ (Song of Seashore) composed by Tamezo Narita from Kitaakita City has been arranged by Donald Brown. Their live tour, which started on July 12th, is now near the end. The remaining performances are now NPO Akita North Center for Gender Equality on July 30th and Machinaka Tobu in Kitaakita City on August 2nd. Although Alan who plays the bass, his fingers skin is ruptured from playing so many times have bandage on his fingers, he still enthusiastically practices with Carl. 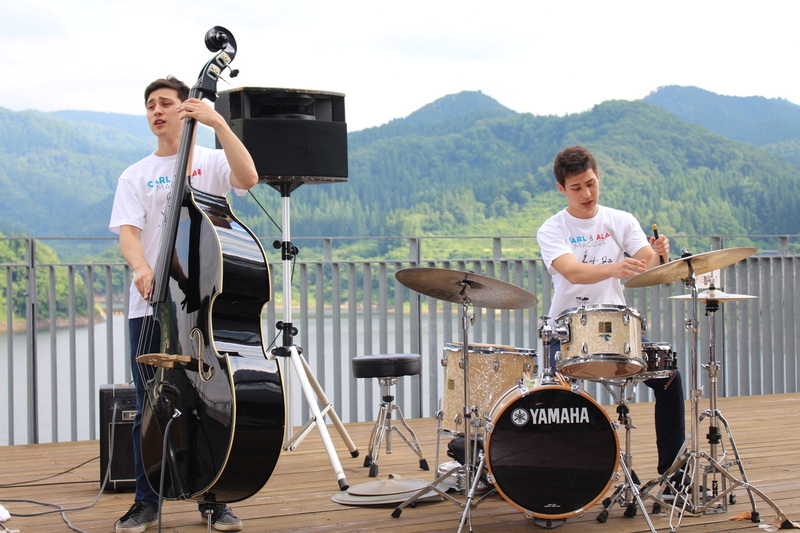 A jazz concert by twin university students from USA was held at Fujisato Town Development Center on July 21 and the audience enjoyed their live performance of the perfect coordination. The concert was organized by NPO Fujisato Genkijuku (Organization for Revitalizing Fujisato Town Chairman: Mr. Hiroaki Fujiwara) and Kokoro & Inochi wo Kangaeru kai (Organization for Mind and Life Nourishment to Prevent Suicide, Chairman: Mr. Toshihide Hakamada). The featured artists were Carl & Alan Maguire who study jazz performance at the University of Memphis. They are emerging jazz artists who are aiming to connect the world with their music. 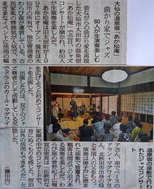 They have been playing jazz at various concerts around Kitaakita City whenever they visit their grandmother. The twin musicians played in perfect harmony. They played their favorite piece, ‘Inner Urge’ which they recorded on their CD, their original piece ‘Alternate Current’ and other jazz standards like ‘Take an A Train’ and ‘Summer Time’. In the end, the audience sang along ‘ Hana wa Saku’ and ‘Furusato’ with them. Carl and Alan Maguire, twin brothers from Tennessee, USA, who aim to become professional jazz musicians held a free jazz concert at Crown Palace Shuhoku Hotel lobby. The audience enjoyed their perfect harmony. They are on their ‘Akita Longitudal Tour’ to spread the message of jazz to different generations as well as building their experience. This performance was a trio with Mrs. Shizuko Naya, a jazz pianist from Noshiro City. Carl and Alan studied music at Stax Musica Academy in Memphis, Tennesse in USA. They were discovered by renowned jazz artist Donald Brown from Memphis, and they will be studying with him at University of Tennessee Knoxville where he is an associate professor. They played many standard numbers like ‘Satin Doll’, ‘A Girl from Ipanema’, ‘Wave’ as well as Japanese classic tune ‘Sakura’ arranged by Alan. They also played music the audience requested to add some extra enjoyment. 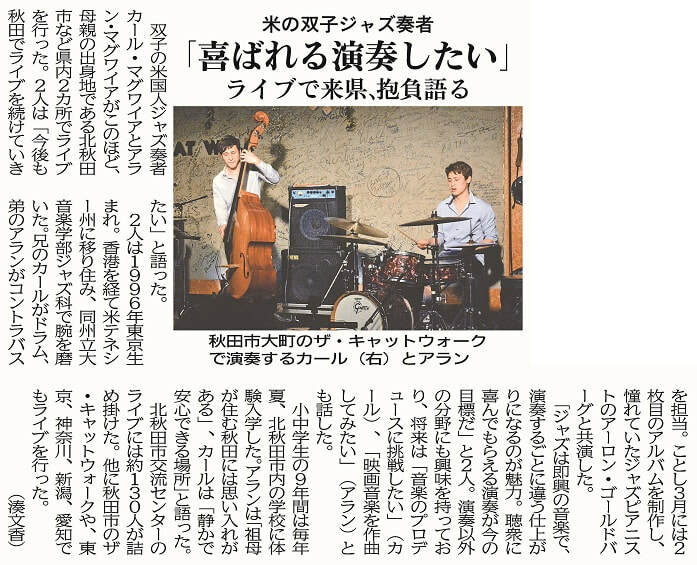 Carl Maguire (18) and Alan Maguire, the young twin jazz students of University of Tennessee, Knoxville, who aim to become professional musicians, are touring through Akita Prefecture where their mother grew up. On July 12th, they performed jazz at event corner of Odate Eco Fair & Mammoth Flea Market at Odate Jukai Dome. Carl and Alan are born in Tokyo. They have an American father and Japanese mother from Kitaakita City, Akita. The family currently resides in Memphis, TN, USA. They recorded their first CD with famous jazz musicians from Memphis and the CD is now on sale. They are visiting Japan with their mother, Yuki Maguire this summer. 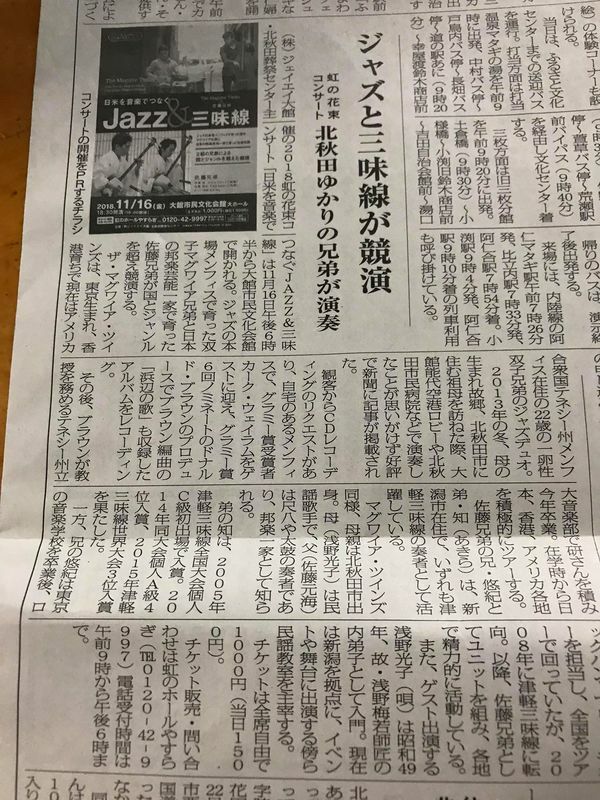 With the help of NPO Akita North Center for Gender Equality, they are visiting various cities throughout Akita Prefecture to perform jazz. They played some Japanese tunes like ‘Hamabe no Uta’ (Song of Seashore) , a popular Japanese classic tune whose composer is from Kitaakita City, ‘Sakura’ (Cherry Blossoms), another Japanese classic tune, both arranged as jazz tunes with upright bass, drum set and piano. They also performed their own compositions. 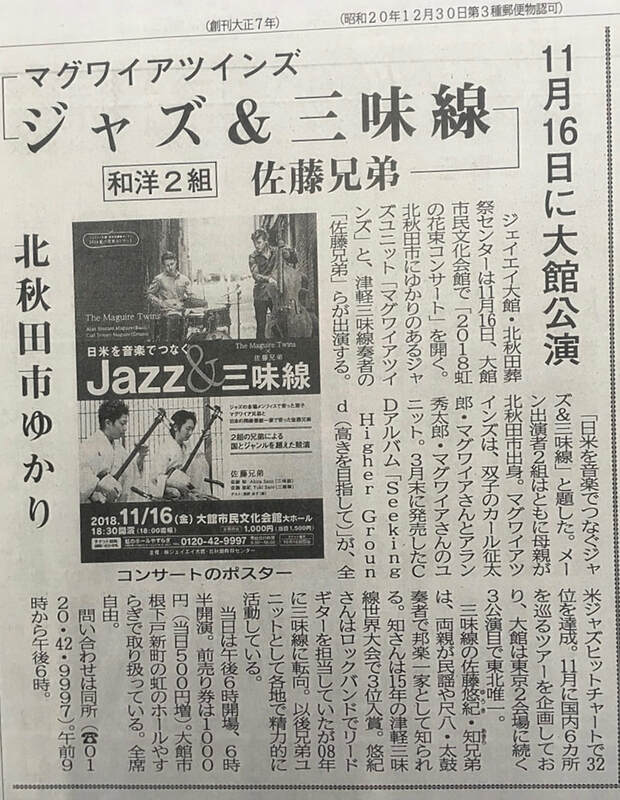 Twin brothers who wish to become professional jazz musicians held a concert at Kitaakita City Central Community Center on December 26th. They have American father and Japanese mother. A big applause came from the audience when they played ‘Hamabe no Uta’ in a jazz style. Renown ‘Hamabe no Uta’s composer (Tamezo Narita) is from Kitaakita City. 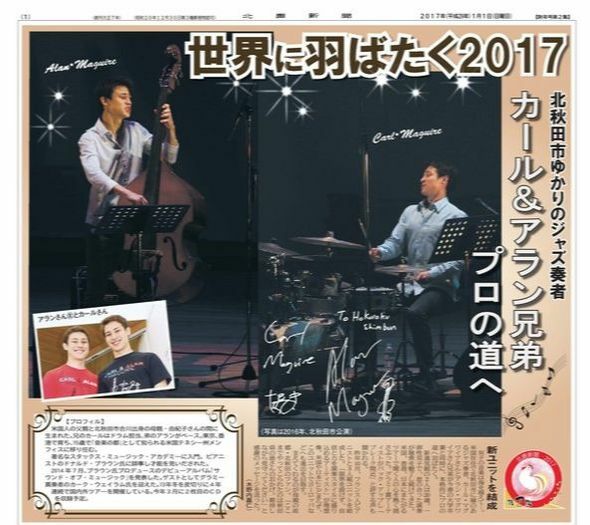 Carl Maguire (17) and Alan Maguire (17), who are currently studying jazz performance at University of Memphis, are visiting the city to see their grandmother in Dojo, Kitaakita City after 3 years. Carl plays the drum set and Alan plays the upright bass. The most notable and popular tune was ‘Hamabe no Uta’ in jazz, specially arranged by their instructor and renown jazz musician and composer (Donald Brown) from USA. Yuki Maguire, their mother who is also an amateur singer, sang along with her clear voice. The audience was enchanted with the popular tune in jazz version and many joined the singer to sing along. The audience enjoyed the twins’ performance and they gave big applause when they played jazz popular tunes as ‘Amazing Grace’ and ‘Take Five’. The concert was 7 hours long that included an open rehearsal and several intermissions. They also held jam sessions with many local musicians including pianists and saxophonists. Their concert series will last for 4 days until December 29th. Today, on Dec 27th, they will play at Kitaakita City Hospital at 4-5pm. 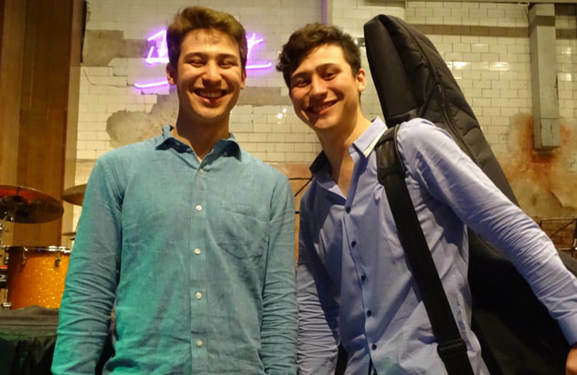 The twins, Carl Maguire (17) and Alan Maguire (17) who are college students majoring music at the University of Memphis were born in Tokyo, raised in Hong Kong and currently reside in Memphis, Tennessee, USA. Their mother, Yuki Maguire who used to be KLM Royal Dutch Airlines chief purser, is from Dojo, Kitaakita City. They are visiting their grandmother, Chizuko Morioka in Dojo, Kitaakita City since December 25th. They visited Kitaakita City a number of times and attended Aikawa Higashi Elementary School and Aikawa Junior High School every summer to experience the Japanese school system with local students. Alan plays the upright bass and Carl plays the drum set. They are going to play jazz standard numbers as ‘My Funny Valentine’, “Misty’. They would like to enjoy playing music with local musicians and are having an open rehearsal and jam sessions. Some of the city’s piano schools’ students are planning to attend. Musician guests are all welcome. The renown ‘Hamabe no Uta’ (Song of Seashore) composed by Tamezo Narita who is from Kitaakita City will be played in jazz format with the special arrangement by their instructor, who is also a famous jazz musician and also a composer (Donald Brown). Yuki, their mother has arrived on Dec 14th prior to their arrival. She says. “I would love for the people of my hometown to enjoy their music. It will also be a very good experience for them who wish to be professional musicians to play for many different audiences.” She will also display 30 photographs of Memphis and musicians that she took in USA.